Vapor degreasing is the cleaning process by condensing solvents vapors on the object that is being cleaned. The process doesn’t require any water or scrubbing. Instead, the machine, a vapor degreaser, uses solvent vapors to cleanse and remove contaminants off of parts. The process is used to clean various materials during manufacturing such as plastic, glass, metal, gold, and ceramic. How does Vapor Degreasing work? At its most basic configuration, a vapor degreaser contains two tanks that are called sumps, a metal basket, and bands of cooling coils. 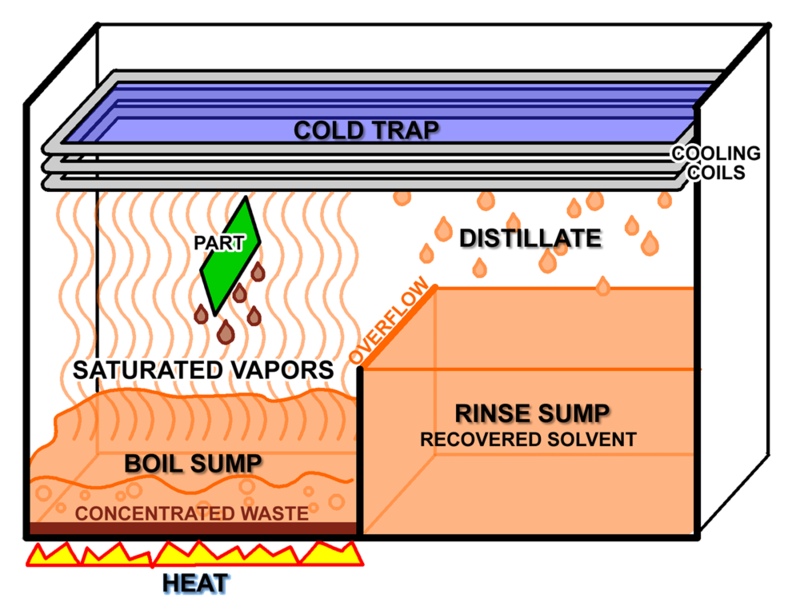 One sump boils the solvent (boil sump) and the second sump (rinse sump) collects the solvent distillate. 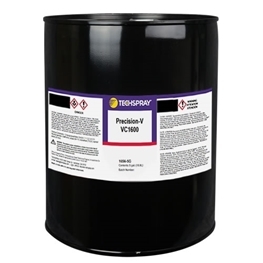 You can take a look at our selection of vapor degreasing solvents here. As a secondary cleaning method, the parts may be dipped into the boil sump, and ultrasonic added for additional agitation. The parts that will be cleaned are placed in a metal basket that is lowered within the machine. The basket remains above the boiling solvent and below the cooling coils. The vapor degreaser boils the solvent. The solvent vapors rise but don’t escape because they’re trapped within the machine by a layer of refrigeration via cooling coils. The vapor then condenses on the surface of the parts dissolving the contaminants. As the solvent drips off the objects it removes the soils with it. This is a closed-loop process, so the solvent is cycled over-and-over again. The vapors go up into the cold trap, condense and run back down into the rinse sump. The rinse sump then overflows into the boil sump. The soil stays in the boil sump and will not travel with the vapor, and will not cross-contaminate parts or the rinse sump. Those who wear glasses will find this process familiar. It happens when someone leaves a hot room or outside, and then enters a cool room. The warmer, more humid air outside will condense as a fog on your colder glasses. Once you step back inside to the dryer air, and your glasses will clear. This is essentially the same process as the term “reflux method” -warm vapors condense back into liquid when cooled. In Which Applications and Industries Are Vapor Degreasing Used? 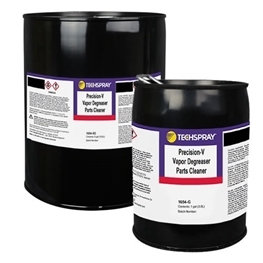 Almost any industry in which precision cleaning is paramount to the manufactured parts, vapor degreasing can be found. It is common in automotive, aviation and aerospace, medical device manufacturing, jewelry manufacturing, and electronic assembly. Various methods have been developed along the way including vapor only cleaning, vapor-spray-vapor, liquid-vapor, boiling liquid-warm liquid-vapor, spray-under-immersion, vacuum degreasing as well as ultrasonic cleaning in conjunction with almost any of these. What Are the Benefits of Vapor Degreasing? The clear benefit of vapor degreasing is the superior cleaning that it delivers and it is a very repeatable process, not as dependent on operator technique and manual cleaning methods. The use of vaporized solvent avoids cross-contamination, which is a problem with cleaning methods that reuse solvents or cleaning solutions from part-to-part. The use of solvents enables that objects dry quickly without a secondary drying process. Although vapor degreaser solvents are generally expensive compared to other cleaning materials, they are continuously recycled in the closed-loop process, which can make it an economic method of cleaning. In addition, compared to batch or inline systems common with aqueous cleaners, vapor degreasing doesn’t require heating water, rinsing, drying parts, or treating wastewater during post cleaning. With the exception of co-solvent or binary solvent degreasing, it’s important that a vapor degreaser solvent is as close to an azeotrope as possible, which means all the solvent constituents boil at around the same temperature. This ensures the formulation does not change as the solvent is vaporized and reconstituted hundreds of times in the closed-loop cycle. Selecting and qualifying a vapor degreasing solvent is in itself an involved topic that we will cover in later papers. In short, you will need to identify a solvent that cleans your particular soil well, does not damage your parts if they are sensitive to solvent exposure, falls within your local environmental guidelines, and at the lowest possible toxicity. Many companies are actively replacing n-propyl bromide (nPB) and Trichloroethylene (TCE) based solvents because of the high toxicity and risk factors, like cancer. If you have any questions that we didn't cover here be sure to post them below. We'll make sure to answer them and add them to future updates in this post. 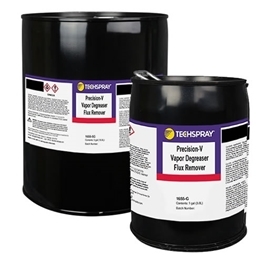 And if you would like to speak with a specialist from Techspray about vapor degreasing contact us today.